Broncos Stadium at Mile High will have a few new faces in 2019. In addition to the acquisition of quarterback Joe Flacco that came earlier last month, the Denver Broncos have signed two more new faces in preparation for the 2019 campaign, adding former Dolphins right tackle Ja’Wuan James and former Texans cornerback Kareem Jackson. According to SportsTrust Advisors, the sixth-year right tackle signed a four-year contract with the Broncos on Monday night, a deal that’s worth $51 million and $32 million in guaranteed money. It’s tough to find average to slightly-above-average offensive tackles in the NFL, so when one does come around in a relatively weak free agent offensive tackle class, it usually results in a team paying them a premium – and that’s exactly what’s happened here. James, who has never graded below 63.0, yet has never graded above 76.0, hasn’t ended a season ranked among the top-25 offensive tackles in the league. His highest-graded season, which came in 2016, earned only a 75.9 overall grade that ranked 28th among 84 qualifying players at the position. Since entering the league, James has been solid, albeit unspectacular, on the right side of the Dolphins’ offensive line. He’s allowed 18 sacks, 20 hits and 72 hurries across his 1821 pass-blocking snaps as a pro, and his five-year pass-blocking grade (72.0), his five-year pressure rate (6.0%) and his five-year pass-blocking efficiency (96.5) rank 20th, 20th and 15th, respectively, among the 33 right tackles with at least 1,000 pass-blocking snaps since 2014. While James’ numbers are uninspiring at first glance, he’s actually an upgrade over everyone that the Broncos have fielded at right tackle over recent seasons. The Broncos haven’t had anyone register a grade of more than 70.0 from the right tackle spot since 2014, when Louis Vasquez recorded an overall grade of 71.8 from his 642 snaps on the right side of the line. 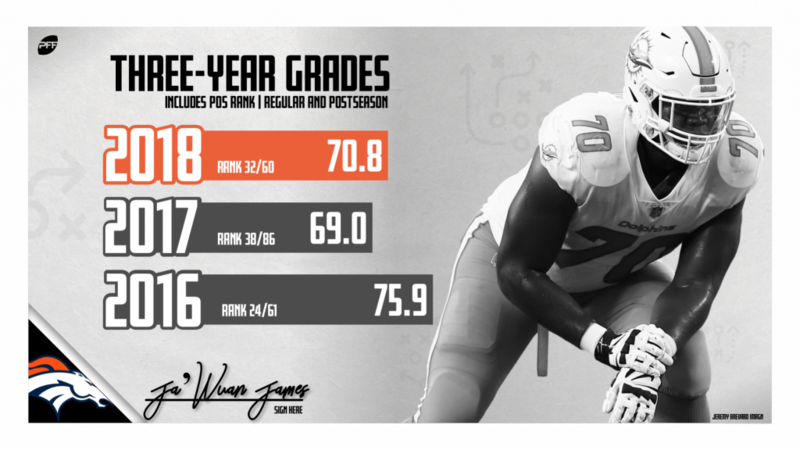 In fact, James’ career-best single-season grade would tie Orlando Franklin for the third-best single-season mark ever recorded by a Bronco, while his 2018 mark of 70.8 would rank as the 10th-best. James will now step into the right tackle spot on the Broncos’ offensive line, and the team will hope that this move goes a long way to fixing a problem that’s been evident for some time. Over the last five seasons, the Broncos’ right tackles have combined to allow a staggering 272 quarterback pressures – the sixth-most among teams in that span – while those right tackles have combined to produce a pass-blocking grade of 54.3, which is by far the worst. James, who has allowed just 110 pressures in the same span, now has the chance to live up to his title as the highest paid right tackle in the NFL.